Joining these various groups has so many advantages. Meeting new food bloggers, learning more about international cuisines, learning new methods and I am actually working slowly through my bookmarked and noted down recipes. I have recently joined a new group International Food Challenge started by Saras and Shobha. the challenge for the month of November were recipes from Australia. While I had a bookmarked anzac biscuits and lamington recipes, I had never heard of damper. The dilemma was to make something I had never hear of or tick off some of my bookmarked recipes. Finally the cookies won as I wanted to give them as a gift to my friend’s family. Anzac stands for Australian and New Zealand Army Corps established during the World War 1. Its been claimed that the wives would make these biscuits to send to the soldiers serving at Gallipoli. The ingredients used to make the biscuits did not spoil quickly and this made it easier to transport them by ship. The main ingredients are oats, flour, desiccated coconut, sugar, soda bicarbonate and golden syrup.Usually these biscuits are chewy and soft at the same time.Some may be crunchy. It all depends on what temperature is used for baking. I loved the taste of the golden syrup. 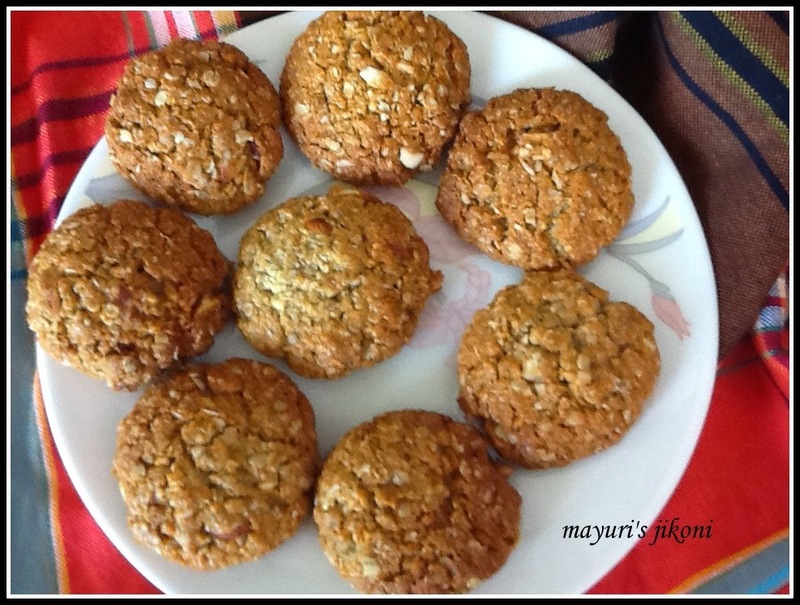 Mix flour, oats, coconut, nuts and sugar in a bowl. Chop the cold butter into smaller pieces. Put the water, butter and golden syrup in a small saucepan. Heat the mixture over low heat till the butter melts. As soon as the butter melts take the pan off the heat. Add soda bicarbonate to the mixture and stir gently. The mixture will become frothy. Add it immediately to the flour mixture. Mix the dough using a spoon. Then mix it well using yours hands. Take a tablespoonful of the dough and roll it into a ball. Flatten it slightly and place it on the prepared tray. Repeat the same with rest of the dough. Place the rolled balls an inch apart as they will spread a little. Bake in the oven for 15-20 minutes or till the biscuits are golden brown. Leave the baked biscuits on the tray for 3-4 minutes as they will still be soft.On cooling they will become crunchy. Remove the biscuits from the tray and place them on a wire rack till they cool down completely. Add only 2 tbsp of water initially. Add the extra one if required. If the dough is dry add the extra water. I found it easier to roll the biscuits using wet hands. If you want crunchy biscuits, flatten them a bit more and bake at 160°C. When you add the hot mixture to the flour mixture, be careful. Mix initially with a spoon or spatula. Very nice biscuits I was planing to make for long time. The cookies look awesome .. healthy bites ! These cookies are flavorful and you made them perfectly dear..